Danilo Sanchez accompanies Lehigh Valley junior youth to the lock-in this spring. HARLEYSVILLE, Pa. – Some of the most diverse growth in Anabaptism along the East Coast is occurring in Allentown, Pennsylvania’s fastest growing city and now a city that is majority Hispanic. Even so, none of the city’s broad range of Anabaptist congregations has enough resources or even youth to maintain a youth pastor. That’s why Franconia Conference, Mennonite Central Committee (MCC) East Coast, and six Lehigh Valley congregations have come together to hire a half-time youth worker, Danilo Sanchez, to minister across the various Anabaptist communities. Through this role, Sanchez, who graduated this spring from Eastern Mennonite Seminary in Harrisonburg, Va., is involved regularly with a diverse combination of congregations unlike those served by just about any other Anabaptist minister in the U.S.: Karen Fellowship, Iglesia Menonita Evangelica Restoracion, Christ Fellowship, Vietnamese Gospel Mennonite Church, Whitehall Mennonite Church, and Ripple. Franconia Conference, MCC East Coast, Whitehall, and Ripple share financial support of the position. Sanchez is primarily responsible for organizing gatherings for Lehigh Valley youth, leading worship at the Whitehall and Ripple congregations, organizing after-school youth activities, and engaging the myriad Lehigh Valley Anabaptist congregations. The partnership of so many groups and congregations makes sense to Bender. She noted that many people from Whitehall and Ripple in particular are neighbors, and some people worship with both groups. 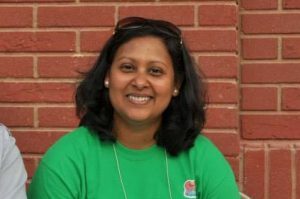 The connection with Franconia Conference and MCC East Coast, she said, is yet another example that people “are looking for ways to connect here and make a difference.” Many congregations already partner with Ripple by cooking meals or sending youth groups to work with children in the city. Angela Moyer, co-pastor of Ripple, wants all different types of people feel like they are welcomed and wanted in the Ripple community, and she hopes Sanchez’s leadership will help Ripple work toward that. Sanchez, who is also working half time at MCC as national director for their Summer Service Worker program, said what makes him most excited and hopeful about the new position is that he can serve alongside the next generation of Anabaptist leaders who God is raising up. “I don’t know what the church will look like, but I trust that the Spirit is leading and at work in the lives of these young people in Allentown,” he said. 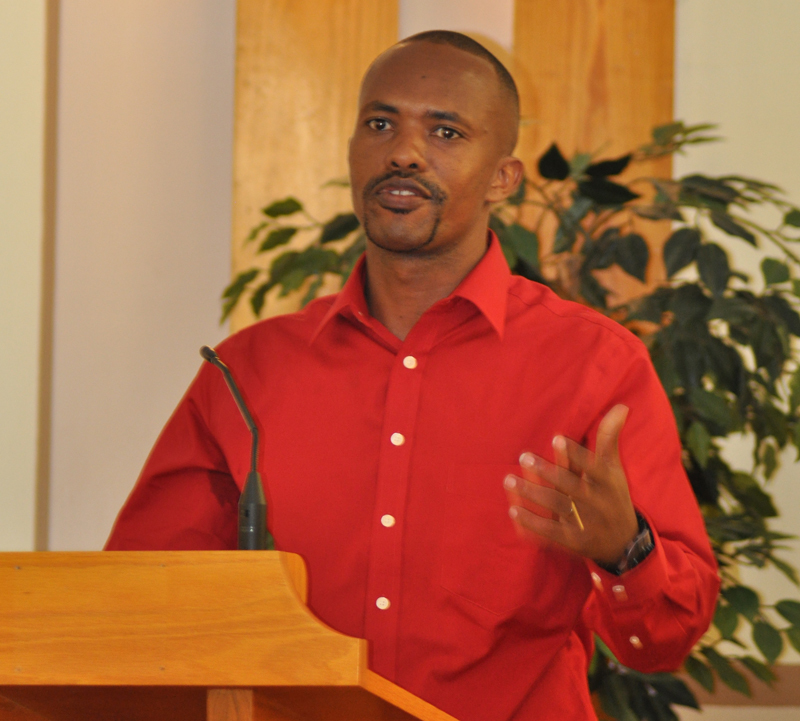 Jean Claude Nkundwa shares his story of living through Burundi’s civil war. Photo by Patti Connolly. I guess I started thinking about this earlier in the summer. I was acting as ‘crowd control’ at a peace camp at Franklin Park in Allentown. The story teller had the kids acting out Acts 10—where Peter and Cornelius move from historic animosity toward friendship and salvation. A Jewish fisherman, a Roman Centurion, and their respective cohorts took on a decidedly urban, Latino flavor. The kids seemed to enjoy the story, but when they were asked to think about why someone like Peter would be friends with someone like Cornelius their answers were painfully honest. When asked to imagine creative ways to respond to bullies—they couldn’t seem to think of anything but fighting back. And I could see why a white woman of privilege, suggesting Jesus would have them do otherwise, didn’t necessarily sit well with them. The memory of that evening stayed with me all summer. 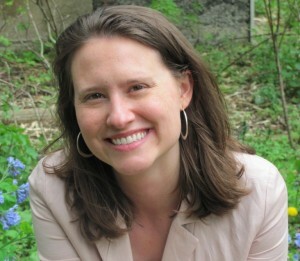 It was why I was looking forward to having Phoebe Kilby, from Eastern Mennonite University’s Center for Justice and Peacebuilding, come and share with our congregation in worship on August 5. She was bringing a current student from Burundi, Jean Claude Nkundwa. In planning the worship, we had chosen to read Matthew 5:38-48 and entitle their talk ‘Can enemies be friends?’ I wanted to hear a modern-day, real life story, from someone who had been willing to drink from the blessing cup of reconciliation. At a Saturday evening gathering and during our worship on Sunday morning, I heard the complicated story of Burundi’s civil war and Jean Claude’s experience during it. He was a teenager when his village exploded in violence from which only three of his family escaped—hiding by day and traveling under cover of night—not knowing who or where the enemy might be. In his words, his “mind was paralyzed” and he questioned the existence of God. He began to believe the only way to peace was through military dictatorship. After our time together, I wanted to bring Jean Claude to Franklin Park. I wanted the kids to hear God’s story about Peter and Cornelius from his lips. I wanted them to hear about his village and his family’s land that is now being farmed by former enemies. I would like them to hear Phoebe’s story, too. When she discovered that she was a descendent of slave owners, she reached out to the descendants of the slaves her family owned. Her journey of reconciliation includes working together with her new-found cousins to fund and install a historic marker at the high school their family had worked to desegregate. I think that each of them would have made the story of Peter and Cornelius come alive to the kids in a new way. Can enemies really become friends? After listening to Jean Claude and Phoebe, I know it is possible, but it requires holy imagination and committed perseverance—joining the work of the Spirit. In reflecting on their stories and my time at Franklin Park, I have been struck by the importance of sharing where my own story intersects with the biblical narrative. Perhaps that is what bearing witness really means. We speak about the Good News we have seen and heard and lived. I wonder if that would have made a difference to my young friends at Franklin Park. I wonder if they would have been more open to imagine another way. I am trusting there will be more opportunities to bear witness and live into the story together—the blessing cup of reconciliation overflowing. 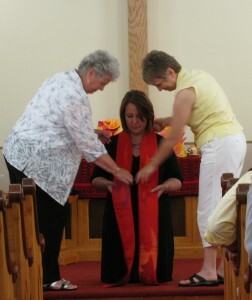 Connie Detwiler was ordained at Lakeview Mennonite Church on May 6. 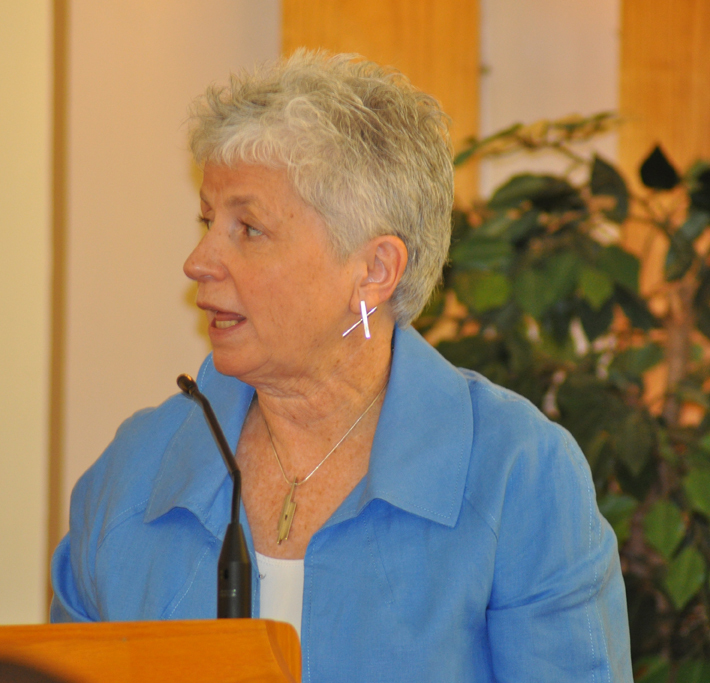 On April 4 the Ministerial Committee approved Connie Detwiler for ordination as co-pastor at Lakeview Mennonite Church. Her ordination was on May 6. Rose Bender was approved for ordination on April 4 as the pastor of Whitehall Mennonite Church. Her ordination is being planned for May 27. Franco Salvatori has been called by the Rocky Ridge Mennonite Church as their permanent pastor. He was installed on March 25. 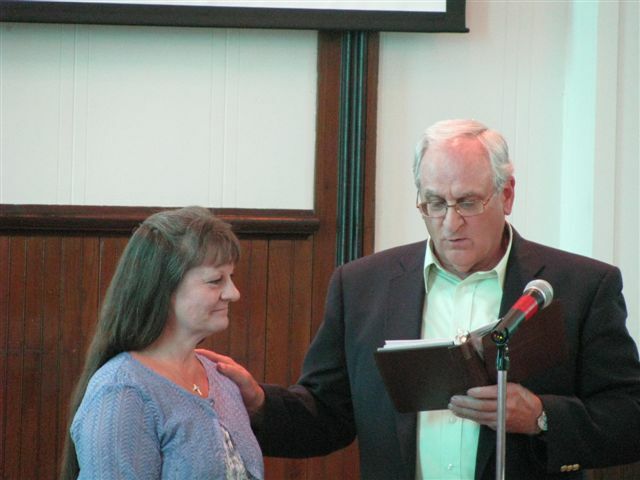 Joyce Hunsberger was granted a license for Christian education and children’s ministries at Salford on April 29. New Life Fellowship in Northern PA has closed. 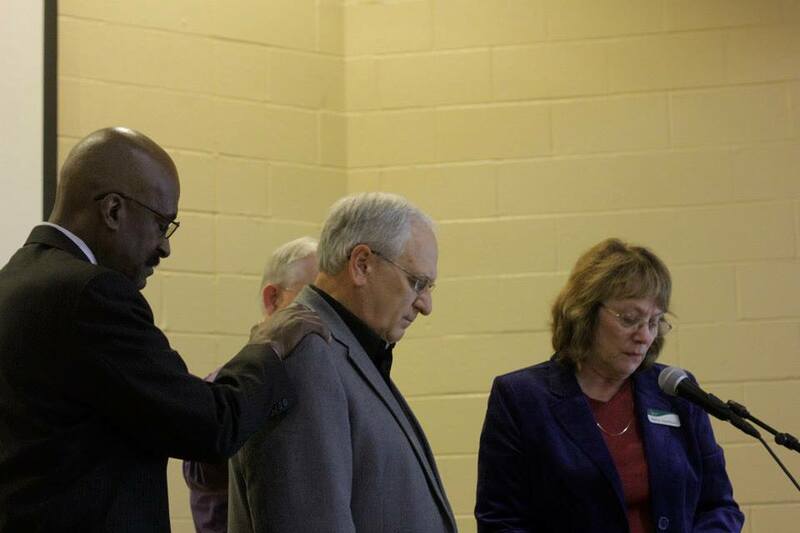 Phil Maenza who pastored the congregation for more than ten years works in the community. Since he is no longer the pastor of the congregation, his specific ministerial license will cease. Unexpected hard places seem to be more common these days. No matter where we turn, we’re surrounded by hard stories—budget cuts, layoffs, natural disasters, school shootings, illness, and broken dreams. It’s unavoidable. Yet in the midst of difficulty and trouble, the reaching out stories abound. The overwhelming mutual support of conference congregations who have been blessed by the ministry of Nueva Vida Norristown (Pa) New Life. Missional experiments in gardening and block parties and dance teams and computer labs. 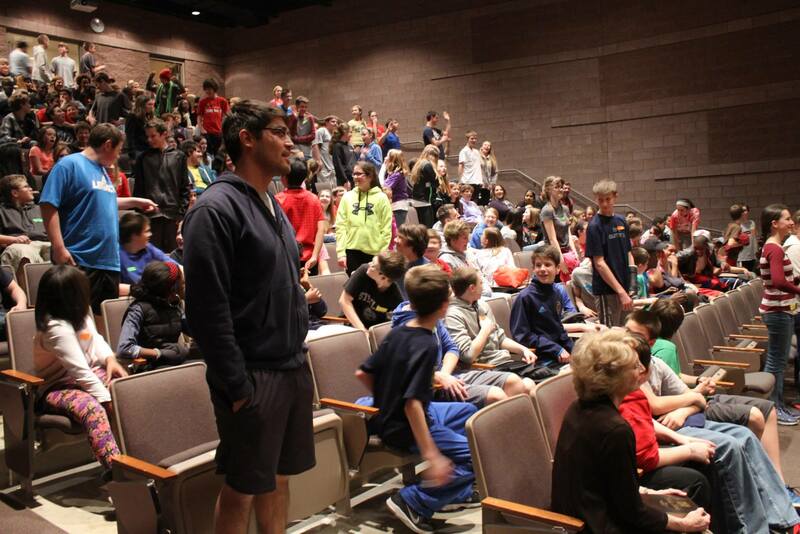 Schools and camps that are discipling children to be radical followers of Jesus. New and emerging leaders who have a passion for the way of Jesus, even as they enter ministry in challenging times. As I read through the stories in this issue of Intersections, I am struck by our need for one another. Would people like John and Sheryl be leaders today if their families and church friends had not identified and encouraged their leadership gifts? 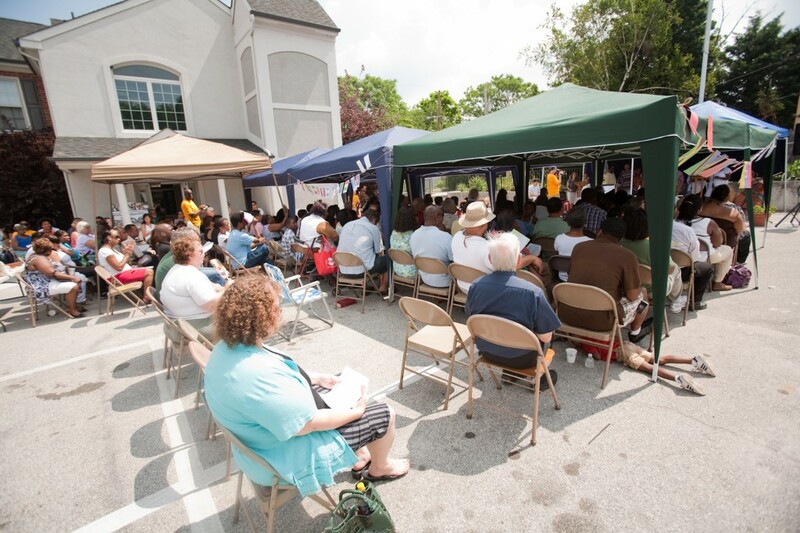 From the individuals, congregations, and businesses that stepped up to join Nueva Vida Norristown’s capital campaign, I heard a motivation to join the Kingdom work that is happening in that setting, as described by Rose Bender, pastor of Whitehall (Pa) congregation. And why would a church near Allentown want to participate in the work of a congregation that’s over an hour away? God has formed us into a community. And we need each other. Earlier this year, Conference board and staff met together to discuss the purpose of Franconia Conference structures and staffing. 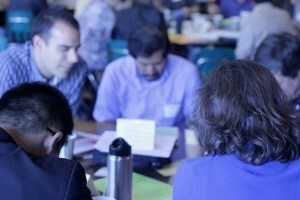 A growing consensus was that “Conference” is more of a network than an institution, here to connect and train congregations and leaders for God’s mission in the world. And as a network, it is so important that we share our stories with one another. We cheer when others celebrate, we mourn when others grieve, we give when others are in need. And in our time, we also receive. A weekly email newsletter to pastors (also available on our website: franconiaconference.org/intersectings) that contains the latest news, blogs, and social media updates from around our conference. A new 4-page format to Intersections that will be published in English, Indonesian, Spanish, and Vietnamese. Connections: a new podcast celebrating our connections in Christ through stories and interviews. Continued experimentation with technologies that allow us to connect with one another despite time, distance, and language barriers, using video, podcasting, and social media. Unexpected hard places will always be with us. But that isn’t the end of the story. There are also unexpected places of joy, understanding, and growth. May our reaching out stories abound! Does your congregation have a story to share? E-mail stories, photos, videos, or blogs to ERalph@franconiaconference.org. And don’t forget to share meaningful moments from congregational life using #fmclife on Twitter! 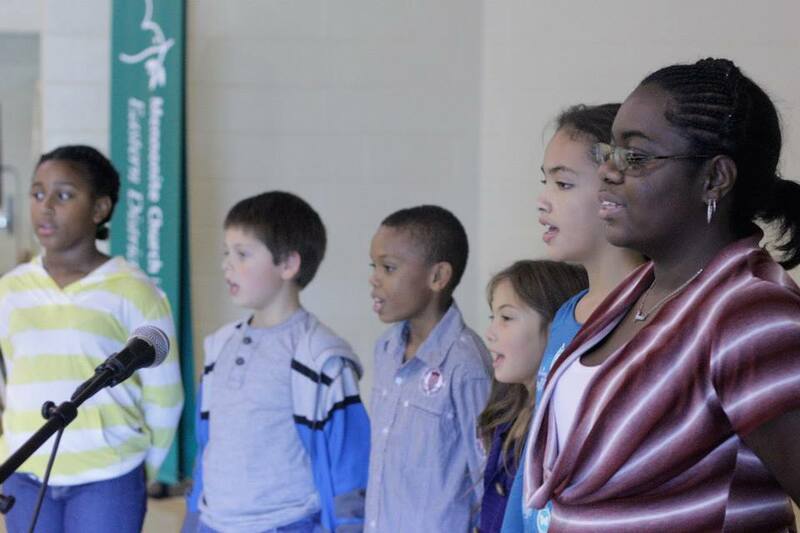 The Mennonite Church USA congregations in Pennsylvania’s third largest city hadn’t to anyone’s recollection gathered for worship together until Sunday, January 29, at the Vietnamese Gospel Mennonite Church. The four diverse communities—Vietnamese Gospel Mennonite Church, Whitehall Mennonite Church and Ripple all associated with Franconia Conference and Christ Fellowship, an Eastern District Conference congregation—met together to celebrate Tet (Vietnamese New Year) through an eclectic multilingual worship that featured singing in three languages, Scripture reading in six languages, and storytelling from each congregation on the theme of God’s abundance in a time of scarcity. Vietnamese Gospel Mennonite Church pastor Hien Truong welcomed those gathered, explaining, “Vietnamese New Year is a marking of springtime. It’s a time of new growth and a special time of asking forgiveness and moving into new ways of building relationships.” While planned by a team from the four congregations, the gathered worship took on a Vietnamese flair with scripture blessings distributed to adults and traditional li xi gifts ($2 bills in red envelopes) for children. Afterward, the congregations enjoyed a carry-in meal that was held together around Vietnamese New Year foods. I was seven and afraid of hell. On the last night of a Billy Graham sponsored revival, in the gym of the public high school, I went forward to receive Christ. There I stood—a little person among all the big people. When they asked us to pray, I obediently closed my eyes and repeated the words. I felt a hand on my shoulder, and snuck a peek to see who was there. Although there were many around me, there was no one with me. Even at my young age, I knew that it was God himself who had placed his hand on my shoulder, alleviating my fears. Years later, reflecting on that event, I recognized its significance. With my limited understanding, I had chosen to follow God. But more importantly, my gracious and loving God had chosen me. Since that day, I have often felt God’s hand on my shoulder—welcoming, encouraging, prodding, protecting, and guiding. God has many hands. I recall my mother telling me, “Rose, God has something special for you to do.” I remember a teacher questioning my college plans, asking me why I hadn’t considered going into full-time pastoral ministry. When I took a job at a school in Trenton, NJ, and settled in Langhorne, PA, my pastor encouraged me to ‘test out’ my calling by participating as a lay minister at the church. A co-worker invited me to attend an open house at a local seminary. And when I began attending Bethel Seminary of the East in 2000, God confirmed my call through many other hands. After seminary, I was still timid about pastoring. I felt God directing me toward the Service Adventure program. I became a unit leader in Johnstown, PA, the only site with eight supporting churches. In my two years there, I received many opportunities to exercise my gifts through preaching and teaching. I served as lay pastor at First Mennonite of Johnstown, the unit’s ‘home church.’ There I was able to see Jesus in new ways. God’s hand touched me through the prayers of Joanne, a woman paralyzed since childhood. God’s hands washed mine through Sandy, a woman who was mentally and socially challenged. God spoke to me daily as I lived in community with young adults who saw the world differently than I did. God has many hands. As I matured in my faith, I experienced Jesus taking my hand in His, allowing me to participate in the work of ministry with him. When the call came to serve as interim pastor at Stahl Mennonite Church in Johnstown, I was ready. And I knew, though the calling and responsibility seemed overwhelming—the work was in God’s hand. I could look back over my journey and see how faithfully the God-Who-Goes-Before had led me. During my first months in that pastorate, I had an accident where I severely burned both my hands. I learned anew the importance of community. I learned for the first time, the humility that comes from being dependent upon the hands of others. In times of doubt, the hand of Jesus comforted me; in times of need, God’s hand provided for me; in times of joy, the hand of the Spirit invited me to dance. 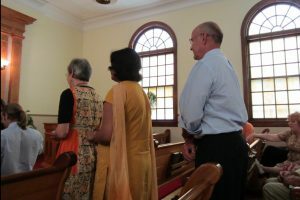 When my time at Stahl was nearing its end, I became aware of Whitehall Mennonite Church, north of Allentown, PA. Their unique story and diversity intrigued me. I was impressed by the practicality and authenticity of their faith. But choosing to take a part-time pastorate seemed risky. Again, God’s hand was upon me and led me forward. I am excited to partner with the congregation at Whitehall—to be the hands and feet of Jesus in the Lehigh Valley. I am forty-one, and still afraid of lots of things. But I am called and chosen by a God whose perfect love casts out all fear. God’s hand is upon me; my hand is in His; I am one of God’s many hands.